In February 2010 Megan and I had the opportunity to volunteer at an organic farm in West Bengal, India. Debal Deb, a UC Berkley doctoral graduate, oversaw this small acreage named Basudha where we stayed, occasional taught at Berkley, spoke around the world, and also ran a seed bank for local farmers. The farm was primarily used to test how some of the indigenous rice varieties of India held up relative to varying soil, irrigation, and planting conditions, but the farm was also used as an experimental plot for everything from other plant varieties to ecological homes and bathrooms. Megan and I assisted in many farming chores while there, but our real learning experience came through our introduction to a swath of literature in our temporary home pertaining to the mission of the farm. Below I introduce Debal Deb’s minor book, Industrial vs Ecological Agriculture, that Megan and I read while there. For anyone whose interest is piqued by this condensed summary, Deb has a new book out, Beyond Developmentality, that we highly recommend. The starting point in contrasting industrial vs ecological agriculture is to realize that modernity, post-industrial revolution, views nature as an object to be dominated, mastered, tamed, and exploited. In other words, the development of civilization always takes priority over the wilderness and indigenous traditions. This human supremacy over nature is in strict contrast to the prior view that culture was in harmony with nature, rather than its antagonist. But for industry, the diversity of nature is far too unpredictable and needed to be subjugated to a homogenizing ideology that simplified and systematized biological resources in order to extract them. Natural resources, therefore, were revalued only for their instrumentality and utility. Science and technology furthermore facilitated in this transition to expanding industrialization by generating bands of engineering professionals that specialized in converting raw materials of nature into commodifiable products. This mindset is no less true for modern agriculture. Monoculture thus took hold as an efficient way to commercialize a few crops at the expense of impoverishing the earth of diverse life forms. Chemical fertilizers were introduced to boost agriculture production, but at the cost of depleting natural soil fertility. Water and irrigation also became costly inputs and have, over time, desiccated surface and subterranean water sources. In the long run such approaches are unsustainable. In the following review I hope to briefly spell out how the Green Revolution, which began in the 60s, prioritized agribusiness that benefited the North and proved detrimental for the South. The North, generally speaking, began giving out loans to the South for agriculture development—particularly via the World Bank—and willingly shared some of their technology during the Green Revolution. Multinational Corporations (MNCs) filled in this First-Third World gap by providing seeds, fertilizers, and pesticides that promised high yields for the South. In fact, the hope of increased food crop production in poor countries appeared to be the solution to worldwide hunger and poverty at the time. The real problem all along, however, and still true to this day, has much more to do with distribution. In the name of alleviating world hunger traditional farming practices and indigenous crop varieties were replaced by “miracle seeds” that promised high yields. Costly industrial equipment, such as tractors and chemicals, were manufactured by the North and sold to the South by these multinational corporations. Developing nations eagerly subsidized such initiatives to encourage agribusiness growth in hopes of making export-oriented profits in the growing global economy. But the kickbacks proved detrimental. To begin with, the irrigation required to support high-yield crop varieties drained water sources over night. As a result water tables dropped dramatically. Chemicals used on the crops poisoned the immediate and surrounding lands by dust, wind, and water run-offs. Due to this pesticide drift many populated areas were been effected and adjacent lands that were overexposed even became sterile. The heavy use of fertilizers also diminished the ground’s water retention capacity and thus led to further soil erosion. As if these were not enough, it is also well known that contaminated crops that are consumed can cause adverse health effects on both humans and animals. High yield seeds also respond well only when the high input requirements they demand are met. Therefore, the increase in productivity they espouse is misleading and incredibly dangerous when there are shortages in these inputs. For instance, high-yield varieties cannot withstand inundation, drought, or salinity in the same way that some indigenous varieties can. Folk varieties are actually better suited for sub-optimal farming conditions and hence provide better food security unlike “miracle seeds.” Historically, farmers were familiar with this notion and had used different seed varieties that were conducive for different contexts. The erasure of this bio-diversity has proved disastrous for farmers and consumers alike. The demand for higher productivity in developing nations also meant heavier deforestation to make room for more cultivable land. Preexisting fields were converted to monocultures and sown more times a year (from once to two or three times annually). Elite cereal crops for the global market (such as rice and wheat) replaced minor crops (such as coarse grains and pulses). Farmers now have to buy imported crops at a high price that were traditionally grown on the farm and, as a result, has led to diets deficient in nutrition. Rather than improving the condition of the poor, an ostensible objective of the Green Revolution, it clearly has done the opposite. Industrial farming requires a lot of up front capital investment, unlike traditional farming, that poor farmers are not able to match. This has led to a widening disparity of income distribution and to a ubiquitous situation of debt entrapment, mass migrations to cities, and even farmer suicides. This enhanced social inequity is due to many factors. Due to water depletion and the inability of aquifers to replenish themselves demand bore wells must reach increasingly deeper water table layers that must be privately drilled that poor farmers cannot afford. The quantity and frequency of chemical use in farming also increases each cropping season. This means escalating input costs for farmers but does not mean increasing returns. In fact, the soil looses its fertility over time due to chemical exposure which translates to slowing outputs each harvest. Therefore, in order to reach even an equilibrium of crop yield each season an increasing amount of fertilizers must be applied. The result is that oftentimes the cost of agricultural chemicals ends up costing more than the farmer would have lost anyway with an untreated field. There are also incalculable costs to human health and environmental damage that are irredeemable. Multinational corporations, like Monsanto, Cargill, and Syngenta, have patented and manufactured genetically modified (GM) cropseeds that tend to replace and eliminate indigenous crop varieties in the name of solving world hunger and malnutrition. 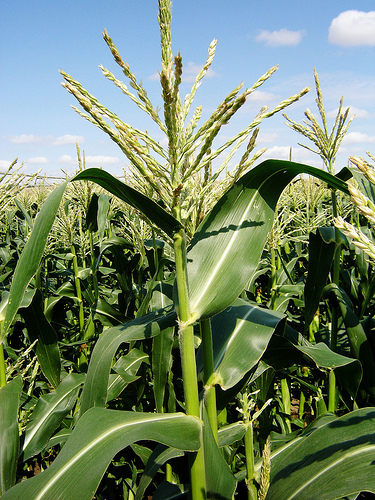 The danger of GM crop varieties is that they are sometimes untested and especially at risk of transferring their alien genes to “wild relatives” by “horizontal gene transfer between GM and traditional crops.” Genetically modified seeds, besides promising higher yields and better pest protection, are also designed to be used in conjunction with agrochemicals manufactured by the same company (e.g., RoundUp). This gives multinational corporations an advantageous monopoly on the agribusiness that farmers end up paying for. The dramatic drawback of this monopoly is that farmers are locked into buying seed at every sowing from the designated seed company (rather than keeping some seed from each harvest for next season) and are compelled to buy the complimentary phosphates, fertilizers, and pesticides by the same company. With the long-term consequences of modern agriculture in view it becomes quite apparent that whatever victory it claims is Pyrrhic; the advantages clearly do not outweigh the costs. Modern agriculture simply ignores many physiological realities including “development constraints to growth, ecological interactions among species, and tends to linearize the relationship between the environment and plant physiology in terms of inorganic chemical ‘inputs’ and grain ‘outputs’.” The Green Revolution, thus, was too short-sighted, reductionistic, and unsustainable over the long haul. There are farming alternatives, however, that are in harmony with the ecosystem and serve humanity in more productive ways over time. Prior to industrial farming agricultural systems were polycultural. Farming included multiple species of crops that were also inter-cropped amongst each other in contrast to mono-crop agriculture. Organic fertilizer, such as manure and compost, was used to release nutrients into the soil gradually unlike synthetic ones. Natural products were used to control pests and diseases instead of poisonous chemicals. Crops were also rotated to replenish soil nutrients and maintain higher yields, a stark contrast from continuous farming. This is not just an idealist longing for the past though. Organic farming has seen an upsurge in popularity among both farmers and consumers in recent years. Cuba is also an anomaly to the industrial age due to the trade embargo imposed on the country. No ag-chemicals or large farming equipment ever made there way to its shores after 1989 so Cuba had to become self-sufficient and has kept its agriculture organic throughout the global development of agribusiness. The diverse and complex ag-ecological systems I have been describing as an alternative to modern industrial farming is actually more productive and resilient in the long run, and oftentimes in the short as well. Although the input of chemicals will seemingly boost farm production, the escalating costs of these inputs actually make farm income proportionately smaller than the more traditional routes. The Green Revolution aspired to master the agriculture process and gain higher yields, but the high doses of inputs required for these “high input-resonsive crop varieties” was a pipe dream and viewed the entire ecosystem far too mechanically. If I had a dime for each time I came to ecclesiaviatorum.wordpress.com! Incredible article! I am trying to follow Debal Deb’s work in India. I live in Canada. I wished to get a chance to speak with someone that had spent time in Basudha, and his/her experience with the experiment and its relevance to saving biodiversity for rice variation in Asia. If possible, I’d like to speak or exchange views with people from outside India that visited his farm for reason above.